The following is an introduction to some of the activity that we as a community involve ourselves in. The Legion of Mary was founded in Dublin on September 7th, 1921 by civil servant Frank Duff (1897-1980). It now has over two and a half active members throughout the world. The basic unit of the Legion is the praesidium that meets once a week for prayer and discussion, as well as practical activities. In the diocese of Kilmore there are now seven praesidia and two junior praesidia. In 1994 a junior presidium was founded in Drumlane parish. Accompanied by their president, they visit the sick in local hospitals and nursing homes, They chat to the patients, sing songs, play music and dance for them. They send used postage stamps to the St Martin Apostolate in Dublin. They bring the Sacred Heart Messenger magazine to the neighbours and keep Holy Water in the fonts in the church. On their last outing the local legion went to Cavan Swimming-pool . They also organised a quiz to coincide with their Christmas party in Milltown hall. Badminton and pool are usually played after each meeting. Milltown Community Alert came into being in May 1995. The Association was set up to combat the ever increasing attacks on elderly people within the community , brought about by the depopulation of rural areas. Co-Ordinators - Twenty persons from the local community. To provide support for the vulnerable in our Community. To provide a safer environment for our people, especially the elderly. To assist these people in their everyday tasks, such as visits to doctors, collecting pensions etc. To regularly call to these people to ensure their needs in relation to heat and food are looked after in winter, and in times of storm. To advise these people in relation to security and the need for vigilance in relation to callers. To provide security medical alert systems for these people to enable them to summon help in the event of an emergency. Thirty-six signs erected in the area, with the permission of the Local Authority, twelve large and twenty-four small signs costing a total of £430.00 - cost of the signs was obtained by means of sponsorship by local businesses; the signs were erected voluntarily by members of the committee. Literature on Crime Prevention distributed to each household in the area. A Talk on Crime Prevention and home security given to the community at a public metting. Survey within the community by the twenty co-ordinators to establish how many security medical systems would be required. Regular visits to the elderly. Many of the vulnerable people within the area live in isolated regions with no near neighbours and some have medical and mobility problems. During the course of visits to these people it was established that a lot of them felt isolated and vulnerable in the event of an emergency. After many meetings and discussions, it was decided to try and alleviate the concern of these elderly people and that Milltown Community Alert should purchase and install a number of Personal Alarms for them. The installation of these systems greatly increased their sense of security in their own homes, giving them peace of mind: this went a long way towards dispelling their feelings of isolation and loneliness. Scallywags is a fun place for children ages 2 to 4. It has many activities for children of all ages to enjoy. There is music, dance and lots more. It is managed and owned by Margaret Leddy, a fully-qualified proprietor. On Fridays there are walks. It helps children learn more. On birthdays there is a cake and a small party. At Christmas there is usually a visit from Santa Claus. Margaret is very patient with children as she has four of her own. There is always a first aid kit on hand. Times are 9.30 am to 12.30 pm, Tuesday to Friday inclusive. All children bring their own packed lunch. For enquiries contact Margaret at (049) 22570. 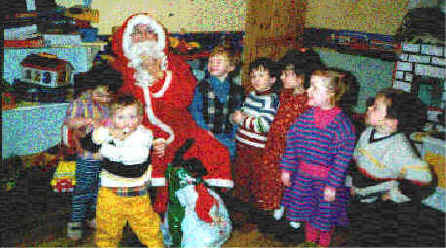 The playschool is situated at Drumlane, Milltown, Belturbet, Co. Cavan. Written by Holly Leddy, aged 10 (daughter of proprietor). Below is a picture taken at last years Christmas party. Presently interest in camogie has been overshadowed by the increasing popularity of Ladies Football. In the late 80's and early 90's interest in ladies football went into decline but recent years have shown a tremendous revival at all levels with a large panel of enthusiastic players and success in many competitions.